Buffalo Technology is launching a range of network attached storage (NAS) devices to work with Windows Storage Server and aimed at small and midsized businesses. The WS5 range of NAS servers, which run Windows Server 2012, are aimed at businesses looking to improve the performance and availability of their storage without dealing with complex network arrangements. 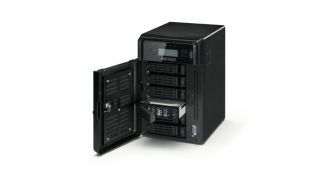 They come with two, four or six swappable bays, which Buffalo says is designed to prevent downtime while providing a total storage capacity of 4TB, 8TB, 12TB or 24TB. All of the server appliances feature Buffalo's TeraStation 5000 platform and house Intel Atom Dual-Core D2550 processors with 4GB of DDR3 memory. Running the Windows Server 2012 operating system allows the devices to integrate with Microsoft's Active Directory, meaning businesses can set security policies to automatically control access to stored data. It also allows straightforward integration with all Windows computers, devices and servers, Buffalo says. Other features include Active Directory support, advanced backup capabilities and scheduled shut down functions to help businesses save on energy costs.